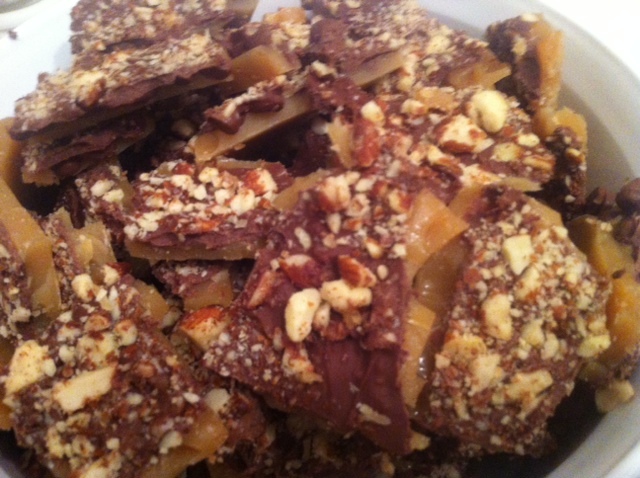 This Toffee is packed with toasted almonds and layered in chocolate. Preheat the oven to 350 degrees. Line a half sheet pan with aluminum foil. Place the almonds on the prepared pan and toast in the oven for approximately 10 minutes, until they are a light golden brown. When cooled take 1 cup of the nuts and finely chop them in a food processor. Remove the rest of the nuts and place off to the side and re-line the sheet pan with aluminum for and this time spray with nonstick cooking spray. Place the cubed butter in a medium sauce pan over medium heat until it has melted, add the water, sugar, salt and corn syrup.